In the first green-on-blue attack in the month of December, an Afghan policewoman named Nargis (also spelled Nargas in some sources) reportedly shot and killed an ISAF civilian contractor at Kabul police headquarters, a secure compound. Nargis apparently planned to gain entry to the compound by attending a graduation ceremony for a police literacy course, but the ceremony was canceled. She then attempted to convince guards she wanted to see the Kabul police chief or the governor, but was told both officials were out. TOLO reports that she shot an American contractor named Joseph Griffin after he entered the area, while other reports indicate she went to the compound’s canteen and opened fire. This is the 46th green-on-blue attack in 2012 (43 have been documented in open sources), and comes 43 days after the last documented attack in Nad ‘Ali, Helmand. NY Times reports Mr. Griffin worked as a police trainer for DynCorp. In a notable exception to its general trend of claiming credit after every publicly-reported incident, the Taliban has not claimed credit for this insider attack and instead simply relayed reports about it on its website (Arabic here, shortened English version here). It should be noted that Taliban spokesman Zabihullah Mujahid describes Nargis as a 40-year-old Second Lieutenant (no rank is mentioned in the Arabic version of the message). The latest Defense Department 1230 report (pdf) estimates that 6% of insider attacks are likely caused by infiltration, 14% by co-option, 3% unknown by likely related to insurgents, and 38% by personal grievances. It is difficult to determine the cause of individual attacks from open sources, but the Taliban is almost certainly not responsible for the proportion of attacks they claim. According to ISAF and information reported on the Institute for the Study of War’s Green-on-Blue site, there have been 87 green-on-blue insider attacks since 2007. Of these, 14 (or 16%) have not been reported in open sources, nor has the Taliban claimed credit for them. This indicates that the Taliban exploits the opportunity to claim credit once they see a public report of a recent incident. Whether or not the Taliban actually manages to play a role, insider attacks have been a boon to insurgents. The green-on-blue problem has affected the public narrative of the war in the United States, United Kingdom, and Australia and sown distrust between ISAF troops and the Afghan forces they train or fight alongside. In response to the summer spike in green-on-blue incidents in 2012, ISAF implemented new policies to mitigate the threat posed by insider attacks. As such attacks become more difficult to carry out against foreigners, Afghan forces have become the primary targets of recent insider attacks (“green-on-green”). 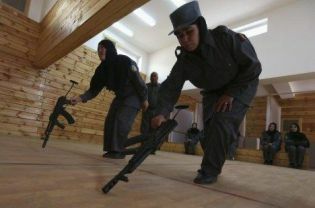 As a female police officer, Nargis may have encountered less stringent scrutiny by male guards, allowing her to pass three checkpoints and enter the secure Kabul police headquarters with her police-issued weapon. ISAF will likely review its new policies to identify similar security gaps and close them. While green-on-blue attacks are unlikely to rise to their summer 2012 levels again, it would be extremely difficult to stop them completely, short of ending the ISAF training mission and segregating all foreign and Afghan forces.